I saw this house in Bethesda’s Charred Oak Estates two weeks ago. The house has some major pluses and major minuses. 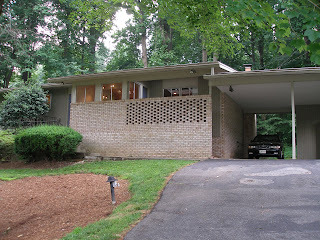 The pluses: cool mid-century design, including car port and front brick work; the back of the house is mostly glass looking onto a patio and wooded backyard; the house is large (5 bedrooms/3 baths). The minuses: While the house is located on a nice lot, the front yard sits on 7 Locks Road–I heard traffic in the kitchen and master bedroom, which are located in the front of the house. The updates to the bathrooms and the yellow mantle contraption built over the fireplace need to go (see the pictures in the listing). If you explore the neighborhood on the west side of 7 Locks you’ll find a host of contemporary homes. I can’t find any information on who designed and built the homes. Does anyone have any knowledge to share?